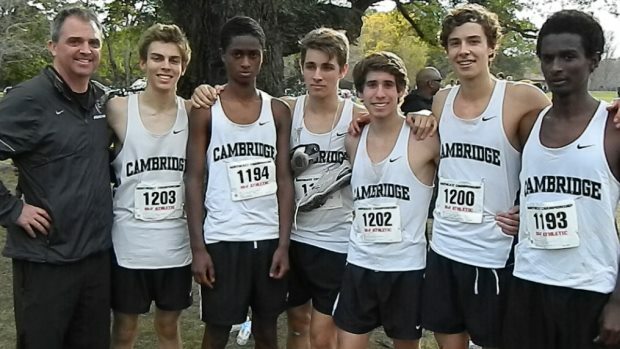 Cambridge Rindge & Latin continues to prove that quality can often overpower quantity. The Falcons, a team with just five varsity runners, captured the Championship race of the Brown HS Northeast Invitational on Saturday. CRL defeated runner-up and last year’s winner St. Anthony’s of N.Y., 65-85. Sophomore Sam Stubbs paced the Falcons with a sixth-place finish. Stubbs, who led his team to the Eastern Division 2 state title last year with an individual triumph, was timed in 15 minutes, 31.7 seconds for the five-kilometer course at Goddard Memorial State Park. Head coach Scott Cody was not surprised with his squad’s effort against a very good St. Anthony’s team. Esu Alemseged finished 13th for the Falcons with a time of 15:59.5. Daniel Aschale (16:04.7) and Michael Scarlett (16:08.4) were right behind in 14th and 15th, respectively. Sam Ingersoll completed the scoring by taking 30th overall at 16:28.6. Cody felt the key in his team’s performance was the final mile. For results, photos and additional stories of the Brown meet, click here.